But then a stranger comes knocking and Florence suddenly senses a restlessness in Will’s spirit that she had never seen before. When he leaves her with only a note that tells her he will return before their baby’s birth, she is devastated, and the illness that stiffened her joints returns. Counting the days until Will walks back through her door, Florence busies herself with a Tree of Life quilt displaying a map of the farm they call home. Doubts claw at her heart as Florence struggles to believe Will’s promise to return to her. Will her labor of love—and faith in God—sustain her as she waits to see her beloved once again? I dislike writing negative reviews, but this is one of very few books that I just couldn't finish. I got about halfway through. I had three issues with it. First, and I know the author doesn't have full control over this, but the book blurb (above) gives away a plot point that hasn't even happened by the midway point of the book. This is annoying because you're left wondering what the point of all the previous stuff is when there's not really any conflict. Second, this story reads heavily like a sequel with lots of snippets of history thrown in, but never fleshed out. That's really frustrating to me when I feel like there's more to the story, but have no way of knowing it. Third, and finally the one that caused me to just quit, the writing was very stilted. I'm not sure how else to describe it, but it just felt forced and didn't flow naturally. I think the premise of the book was interesting and I was intrigued to think about the setting because I want to college very near the location and thinking of it as nothing but woods with a few farms here and there was crazy because now it's a very city suburb type area with just a few farms father out. Unfortunately I wouldn't recommend this one. 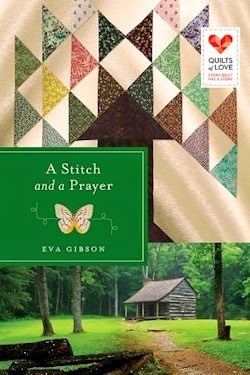 Eva Gibson is the author of twenty books, including A Stitch and a Prayer, the latest release in the Quilts of Love series from Abingdon Fiction. She currently teaches Writing Your Life Story classes for Portland Community College and is an active member of Oregon Christian Writers. She has lived most of her life on the family farm in Wilsonville, Oregon, which is the setting for her novel.